Finding your all-time best hunting pants can be a daunting task even for the gurus and fashionista out there. Each year generates new trends in hunting apparel, which can be confusing for enthusiasts who don’t know whether to keep up with the latest trends or go by the “old is gold” rule. Some people want a fashion-feel in their hunting clothes, while others simply want a comfortable cover-up that is functional in keeping them warm and protected from the harsh wilderness atmosphere. Also, there is different apparel such as shirts, tops, pants, shorts, and overalls, which is perplexing for newbie hunters who don’t know how they should dress for their first coursing expedition. We understand what hunters go through, especially if they have little or no knowledge on what to look for in preferred tracking apparel. Not to worry, this article will provide tips on what to look for in good hunting clothes, depending on your touring location, different brands and the hunting clothes currently present in the market such as Elk hunting camo and warm hunting pants. We will help you find perfect apparel that is efficient and comfortable so you can fully engage your mind on your hunting quest. 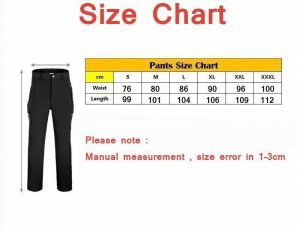 How to Find the Best Hunting Pants? This article offers insight into what features to consider such as location, weather conditions, and your budget when choosing the right attire for your trip and also recommends some of the clothing that every hunter needs. There is no such thing as “One size fits all” hunting pants that fit both sexes and sizes. It is crucial you obtain the right size pants for hunting as every clothing brand differs in size. For instance, one brand’s size 6 could be another brand’s size 8. We recommend getting bigger pants with room that can also fit base layers for efficient warmth. Also keep in mind the length as having pants that drag or ride up can be troublesome for hiking or making lengthy trips in the wilderness. We also advise you read up on buyer reviews and questions on online items to get a general idea of what size fits best. Go for a more fitted size depending on a particular brand. Scent-blockers, waterproof, breathable, thin, lightweight, and insulation are a few things to consider when finding the best material for your best hunting pants available. Each material is suited for different occasions. Therefore, it is important to keep in mind where and when you wear them. Quiet hunting clothes are ideal especially if you do not want to scare off the game. The material best for this is Merino wool. Waterproof hunting pants are perfect for wet weather conditions as its purpose is to protect individuals from getting wet. Nylon and polyester hunting pants are great waterproof fabrics to keep water and moisture out when flashing pheasants in saturated uplands or rainy woodlands. Elastic waist hunting pants offer ultimate comfort for whichever activity. The best wool hunting pants are great for any tracking occasion. They can withstand any weather, comfortable and found in large varieties and designs. We recommend good hunting clothes that come with zipper pockets and belts which are great for holding your knife or other items if you want luggage-free travel. We also recommend hunting pants with knee pads to protect your knees when crawling in small spaces or hiking up rocks. Aside from the fabric, weight also plays a crucial role in personal comfort compared to other aspects. It can either provide effective protection or restrict movement. Generally, what makes your attire feel heavy is the fabric density and extra accommodations. Durable pants with several pockets tend to feel heavier compared to less durable designs. 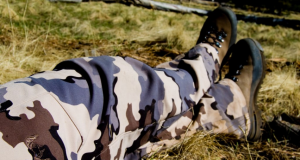 Aim at finding the best lightweight hunting pants that will ease your mobility. There are various good hunting clothes ranging from camo to plain, long or short. Examples of top rated hunting camo include 3D camo, breakup camo, and mimicry camo, which can be selected depending on the habitat you intend to traverse. What’s your habitat like? Consider the places you frequent. Game animals tend to scare easily if they catch a glimpse of predator movement and camouflage helps you go unnoticed. Camouflage simply blends you with your environment, which is why the colors are inspired by mother nature’s rich soil and vegetation. 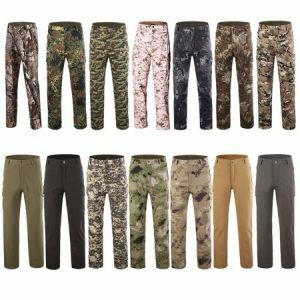 View all available camo colors before choosing your best Elk hunting pants or best deer hunting clothing. The purpose of dressing up is to safeguard from insect bites, branches, and weather. You want to protect your legs from cuts and scratches and being comfortable is of essence regardless of the weather. Material such as polyester are suitable for cold weather and they come with moisture wicking to retain warmth and dryness. The warmest hunting pants include synthetic material which is lightweight, with superb heat retention and is comfortable and maneuverable. Pants are an integral part of your ensemble. They are meant to protect your body from harsh environmental elements such as rocks, and branches. Thin bottoms are not ideal for cold climate, otherwise, you risk freezing to death. They are however great for warmer climates to allow sweating and cooling of the body. The best hunting pants are those that meet all your environmental and climatic needs, while still looking fab. To have the greatest hunting experience, you need the right gear, and that includes the best hunting pants. To stop from endlessly browsing dozens of pants, we’ve gathered the 10 top-rated products in an effort to find the right ones for your needs. We go over the benefits and disadvantages of each pair so you have enough information to make a decision. Carhartt Men’s Camo Washed Duck Dungaree Pants are some of the best pants for hunting considering their overall durability. They can withstand any rough use you put them through. In addition, they have reinforced pockets for tools. Made from cotton, these are designed durable and don’t weigh much. They don’t have much resistance to weather though. Carhartt Men’s Camo Washed Duck Dungaree Pants feature classic Carhartt durability and several pockets for holding the tools you need. 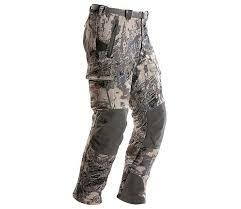 Arctix Men’s Snow Sports Cargo Pants are designed for outdoor sports but work well for hunting. 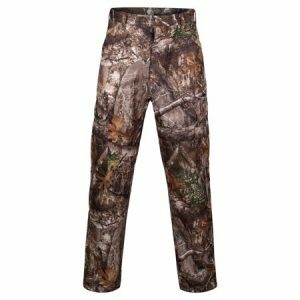 If you need warm hunting pants, these are made with ThermaTech insulation. In addition, there’s a breathable material to wick moisture away. These feature an adjustable waist and reinforced seams. Made from lightweight material, these feature water and wind resistance on top of insulation to keep you warm. Arctix Men’s Snow Sports Cargo Pants are a go-to for those colder, wet hunting days due to their insulation and water repellency. When looking for elk hunting pants, consider King’s Camo Cotton Six Pocket Hunting Pants. They feature an elastic side waistband, large belt loops, and several cargo pockets for storage of all your smaller hunting necessities. These have a relaxed fit so you can easily layered underneath. With a cotton/poly blend, there’s no risk of shrinkage. Material is light enough to keep you cool in warmer seasons. King’s Camo Cotton Six Pocket Hunting Pants allow for convenient storage with a relaxed fit that’s comfortable and breathable. Mossy Oak Camouflage Cotton Mill Hunting Pants are made from soft material for those who want a quieter experience on the hunt. For your comfort, these are elastic waist hunting pants that can easily be adjusted. You can find them available in several camo color patterns. The blended material grants good durability, while the cargo design gives you six pockets total. They are lightweight for easier hunting in warm weather while giving enough room for a base layer on chillier days. Mossy Oak Camouflage Cotton Mill Hunting Pants feature a partial elastic waistband so you’re kept as comfortable as you are disguised. 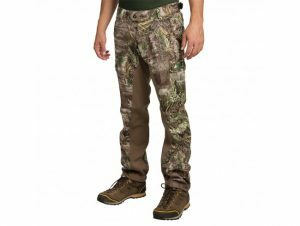 Trail Crest Men’s Camo 6 Pocket Cargo Hunting Pants are the go-to cotton and polyester hunting pants due to how rugged and durable they are. They are fitted but come with adjustable waist tabs for personalization. In addition, the pants feature a full cuff fit for comfort. These cargo pants are made using cotton twill, which doesn’t provide good waterproof capabilities, but do make them durable and lightweight. 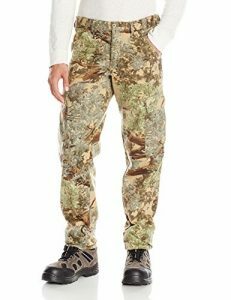 Trail Crest Men’s Camo 6 Pocket Cargo Hunting Pants allow you to have breathing room while you move and crouch while hunting. One of the best pants for hunting is SITKA Men’s Timberline Pants due to how ready they are for harsh environments. They have reinforced knees and seat made from waterproof fabric, making the pants ideal for snow or rainy hunting. Additionally, they’re articulated for comfort. The polyester blend helps make the pants breathable, comfortable, as well as weather resistant. They aren’t as lightweight as other pants though. SITKA Men’s Timberline Pants are great for winter or rainy season hunts thanks to reinforced seat and knees as well as waterproof capabilities. Krypek Men’s Tactical Stalker Pants easily increase stealth with their seamless camo style. 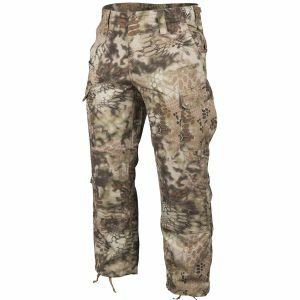 Made from Kryptek, a company known for top-rated hunting clothes, these offer a relaxed fit, minimal shrinkage, and reinforced stitching around the knees. On top of that, these have a reinforced seat. Their cotton/poly blend is reliable to hold up to frequent use. However, they don’t protect against heavy water well. They do have breathability though. 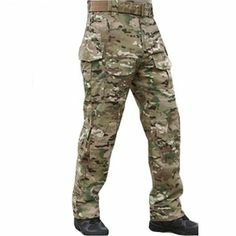 Krypek Men’s Tactical Stalker Pants have convenient pockets and reinforced stitching with the knees and seat for lasting comfort. Another company that makes some of the best hunting clothes is Scent Blocker, and they prove that with the Scent Blocker Knock Out Pant. These have a full-length gusset so you have greater mobility while tracking your game. Furthermore, they keep your scent concealed so you hunt undetected. The fabric is breathable and stretches well to provide freedom of movement. These hold up well in general terrain, but aren’t intended for rough use in harsh weather. Scent Blocker Knock Out Pants perform well keeping you fully disguised with their camo pattern and scent-concealing technology. 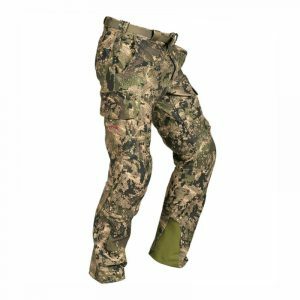 Many consider the SITKA Gear Mountain Pants the top hunting pants because of their 4-way stretch fit and contoured fit pattern. They allow for excellent movement so you can run, jump, and do anything active while hunting. There are minimal noise and friction as well as articulated knees. These pants are blended well for versatility and durability as they can repel mild water with no issues as well as being quick to dry. SITKA Gear Mountain Pants make you feel as though you’re wearing athletic pants that are quiet and comfortable. King’s Camo Hunter Series Pants feature six pockets and an ideal weight that makes them useful for all-season wear. They’re among quiet hunting gear considering the fabric makes minimal noise while you move about, and wearing them is as comfortable as walking in cotton pants. The polyester fabric features quick dry technology that helps repel water. For the cargo design, there are six pockets total. King’s Camo Hunter Series Pants feature a reinforced seat, quiet fabric, and comfortable weight for use in multiple seasons. So, now you’re caught up on our take of the top 10 best hunting pants on the market, what else can you learn about them? You may have some additional questions concerning the products such as how to properly take care of them so they last. To answer your question and teach you more about the pants, we’ve compiled some brief, thorough information below. 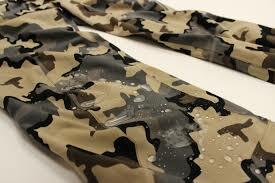 How do you wash camo clothes? Even if you have the best camo clothing, that doesn’t mean you can get away with not washing them when they get dirty or smelly. It’ll extend the life of them as well. First, consider following the directions that came with the pants. Now, as for a general walkthrough, you can machine wash your clothes. Be sure any attachments and pockets are closed. Before putting them in the wash, turn them inside out. This way, the camo pattern isn’t exposed as much and won’t risk fading. 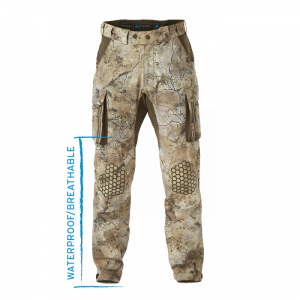 Scent Lok is one of the most popular and leading brands of scent blocker hunting pants. They use technology in an effort to eliminate odor. In addition, it absorbs your odor so you are better concealed as you hunt, making it difficult for your game to sniff you out. How do you get the smell out of hunting clothes? There are a few ways to get smells out of your hunting pants. Of course, you can wash them, but aim for detergents that don’t have any perfumes as those can cause your game to detect you. If you have scent-repelling clothes, it can work in your favor. However, you can always purchase odor repellents for hunting gear and give your clothes a good spray. What is Durable Water Repellency? If you’re seeking something that you can wear in wet weather, having pants that are labeled durable water repellent can keep you dry. The most durable pants feature fabric that repels water with ease rather than absorbs it. Any fabric treated with this allows water to simply roll off, a feature that can also keep you warm on those chillier, rainy days. 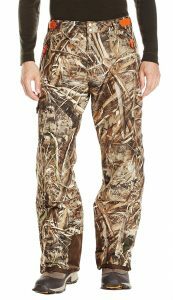 Our top choice for the best hunting pants goes to Carhartt Men’s Camo Washed Duck Dungaree Pants. They’re reliable enough to hold up against roughing it while you hunt, and they feature several reinforced pockets to stash necessary tools. Arctix Men’s Snow Sports Cargo Pants: Reliable insulation and wind protection. King’s Camo Cotton Six Pocket Hunting Pants: Deep pockets and lightweight fabric. 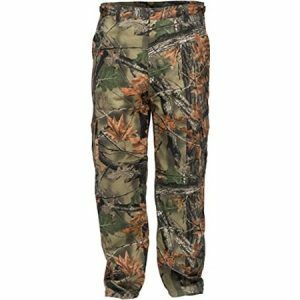 Mossy Oak Camouflage Cotton Mill Hunting Pants: Quiet material with adjustable waist. Trail Crest Men’s Camo 6 Pocket Cargo Hunting Pants: Breathable with the versatile camo pattern. SITKA Men’s Timberline Pant: Reinforced seat and knees with water repellency. 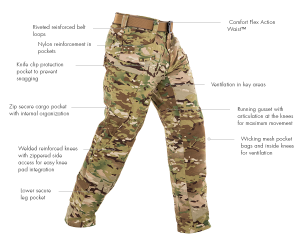 Krypek Men’s Tactical Stalker Pants: Comfortable with easy-to-use pockets. Scent Blocker Knock Out Pant: 4-way stretch offers free movement that’s quiet. SITKA Gear Mountain Pant: Contoured fit with water-repellent fabric. 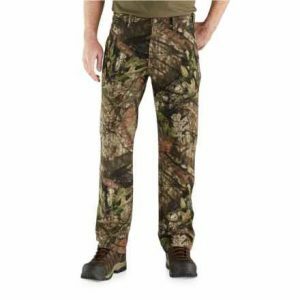 King’s Camo Hunter Series Pants: Several pockets and reinforced seat. 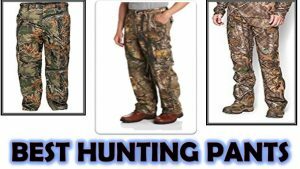 We hope you enjoy reading our reviews of the best hunting pants.